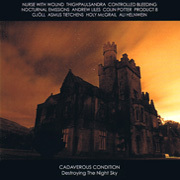 A collection of remixes of tracks from the Cadaverous Condition album ‘To The Night Sky’ created by a varied roster of invited artists, released by Klanggalerie. Packaged in a jewel case. Be aware: due to the sloppy way the discs were shipped to me, there is some minor wrinkling and scuffing on most of the inserts. Duration: 73:22.